40 pound cubera snapper taken on a 60 ft reef titled " Pargo Alley"
The single grouper was taken on the pacific side of baja and that fish was shot at 91ft ( my deepest so far ) ; the area was a sea mount that came up to 85 and was loaded with big groupers. 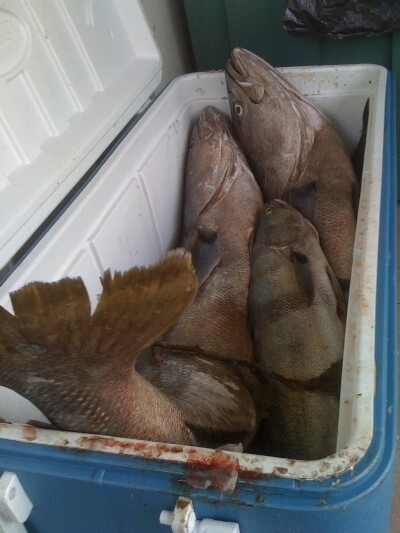 notice the last pictures had grouper up to 60-70 pounds! The next shot is some of the nicer fish we took in the tournament on day one. The next is the second day of the tournament with much larger of a variety of species. Uhus (parrotfish), wahoo, pargo amarillo (yellow snappers), pargo mullato (barred pargo), and Pargon (cubera snapper), cabrilla (leopard grouper), Pez Gallo (Roosterfish), ONO (wahoo)... there were tons of species targeted to hit points for each day. Tournament starts at 7am and boat pulls in before 4pm each day. The hawaiians filmed an episode of our trip and will be airing the episode with diving footage and interviews in a few months. I went out with a buddy and woke up at 5am again to get on it early. We managed up the coast and in the water at around 730a. The vis was bad, and the kelp on the outside spots were laying over because too much current. When it is like that you cant really hunt it at all and WSB do not like current. We moved to an inside bed and it was pretty dead, but after a few hours I managed a 10lb WSB. I was stoked to say the least because this was my third trip and my third fish, I felt great! I have dove for literally 300+ hours in the water this year and today was by far the most special time so far. 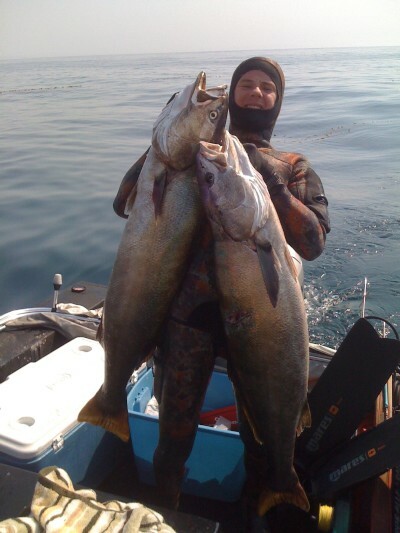 So at around mid day we went back out to the high spots and pinnacles and to our great suprise the current settled and the kelp was up, the vis had changed to 40 feet blue from 5-10' haze. We could make out the bottom perfectly. My friend has dove this area for years and has never seen it this good and truthfully this spot is 75% of the time not diveable because it is so dynamic, which yesterday showed me (blacked out vis and kelp laying over just like the first 4 times I took my boat there). I anxiously got in the water and see an albino opaleye fish, which is extremely rare. I for some reason resist the urge to turn and yell at my friend on the boat of my sighting. Here it comes; a nice fish. I try and not become to anxious or force this. I wait, which seems like forever but only a few seconds. As the fish is coming closer to me from underneath I quietly as possible slip in the water with aim in the fish's directions; it spots me and turned to bolt and I got him! Stoked. I felt all these hours hunting this one species is finally paying off. My friend, who has taken more whites than me and hunting much longer had not even so much as a tail fin all day long. I decided to swim 1/4 mile to a different area that I never hunted. There was another boat on the spot and two older divers in the water. I was in a really good rythm of stalking and constantly moving. I passed another diver in the water, he just as slow motion as I. I was already so satisfied, that I had more than patience I was in the zone. I am at the end of a breathhold and between two stalks I am so suprised I see another fish swimming away, I quickly position my gun and take the shot. Those first couple seconds they take off and you dont know if you hit it because your shooting line was slack. Then the reel started to budge and I knew I was on! I let the fish run and didnt horse it; I had not even yet realized that I just shot my first limit of WSB. It has been a joke if anything to mention that as a possibility. Not only did I take the two fish my last two trips, but I actually did it. I still can't believe it, especially because the fish were all singles and my friend and those two other better divers; none of them spotted fish. God was on my side today, it is the only thing I can say. 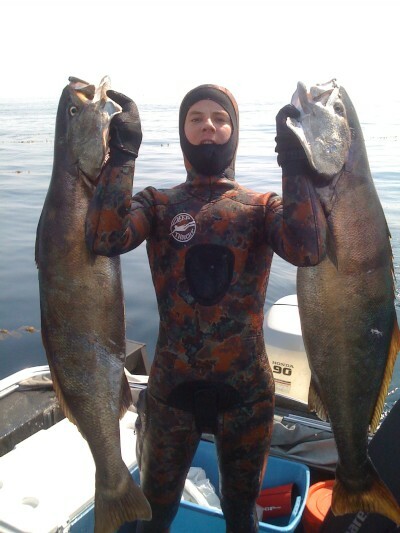 I am starting to consider myself a pretty ok spearfisherman, so stoked I just had to share my story of the best day I have ever had diving, and probably the most fun in my life.